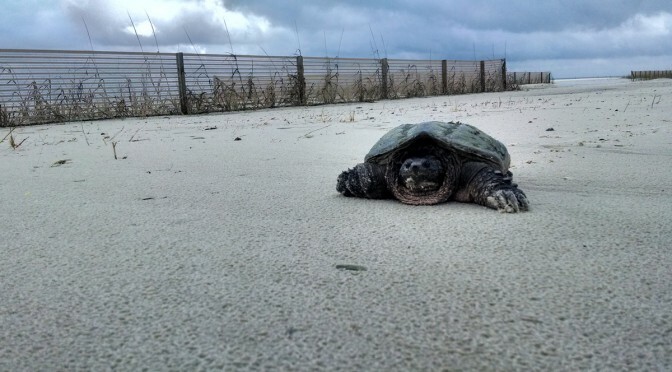 Snapping Turtles like to hang out on the beach too! Driving down the beach road in Waveland, I was heading towards Bay St. Louis when a large creature kind hobbled across the road. It had a weird gate and at first I was unsure what type of animal it was. As I got closer I could see it was a huge snapping turtle. This Turtle was heading out onto the sand to most likely get a tan. The Waveland beach was beautiful and sandy. It was also probably a little warmer than the fresh water pond this guy was hanging out in most days. Just wanted to share the picture of the turtle on the beach! A truck can be seen picking up the Rental Jet Skis on Biloxi Beach. It is just odd to see a big truck intentionally drive into the Gulf of Mexico. After seeing how well the loading works, we understand and applaud their choice. Neat to see if you are out on Biloxi Beach!